July by the Numbers returns to the United States for a stop in Cleveland for jersey #10. After purchasing the Cleveland Barons franchise in the AHL, owner Nick Mileti , who also owned the NBA's Cleveland Cavaliers, attempted to buy a franchise in the NHL. 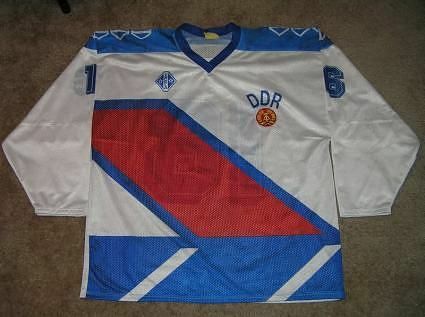 When that plan did not pan out, he instead bought a franchise in the newly created World Hockey Association. 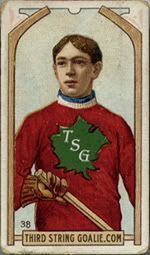 Unlike the franchises on Boston (New England), New York, Philadelphia, Chicago, Los Angeles and Minnesota, the Crusaders did not have to compete directly with an NHL club in their own back yard. In addition to being the only show in town, the Crusaders made a splash by signing defenseman Paul Shmyr away from the California Golden Seals but really grabbed the headlines when the lured goaltender Gerry Cheevers away from the defending Stanley Cup champion Boston Bruins in arguably the most noteworthy signing by the WHA after Bobby Hull and Gordie Howe. The club found a home at the aging Cleveland Arena, which was built back in 1937 and seated less than 10,000 fans. 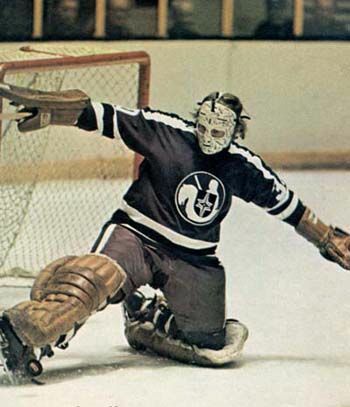 Backed by the strength of Cheevers goaltending, the Crusaders had a fine first season, finishing second in the Eastern Division with a 43-32-3 record while allowing the fewest goals against and averaging 5,287 fans per game. In the playoffs, they swept the Philadelphia Blazers in their final games in Philadelphia, but were dispatched easily by the New England Whalers 4 games to 1. Still playing in the Cleveland Arena in 1973-74, the Crusaders slipped a bit in the standings, winning 37 games to a third place finish in their division, but attendance was up nearly 20% to 6,212. For the playoffs, the Crusaders faced the Toronto Toros, who had relocated at the end of the previous season from Ottawa, and the Toros ended Cleveland's season in five games. For the Crusaders third season, the club debuted a new home, the Richfield Coliseum, 25 miles south of downtown. Their new arena had room for 18,500 fans and was one of the first with new luxury boxes. While it was rather far from Cleveland, it was hoped that fans from Akron to the south would also be willing to make the drive north to the new arena. Despite dropping to a 35-40-3 record, the Crusaders finished second in the Eastern Division and were the final qualifier for the playoffs. As the lowest seed, they drew the #1 overall team, the Houston Aeros who had little trouble closing out the Crusaders 4 games to 1. Although attendance rose with the move to Richfield, up to 6,931, it was certainly less than hoped for, as issues arose with the Coliseum. 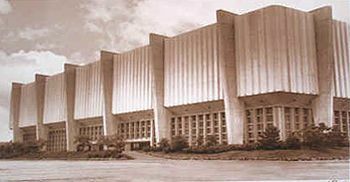 It's single concourse, which served both levels, quickly became crowded and many fans were often late arriving to games due to the two-lane rural highway which led to the arena, especially on days when the snow came in off Lake Erie, backing up traffic several miles. Additionally, the luxury boxes were at the highest level of the arena, making them actually the worst seats in the house. 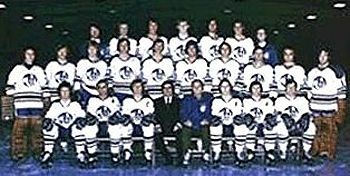 For the 1975-76 season, Mileti sold the club to Jay Moore, but it was more of the same for the Crusaders on the ice, as they posted a nearly identical 35-40-5 record while finishing a narrow second to the Indianapolis Racers for the Eastern Division title as attendance sank to 6,356. The signs of real financial problems began to show themselves, which led to Cheevers leaving the club in mid season to return to the Bruins. 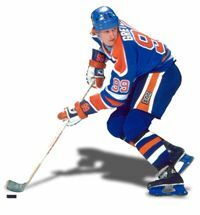 The club then faced off against the Whalers in Preliminary Round of the playoffs, getting dumped in three straight games, bringing and end to the Crusaders after four seasons. 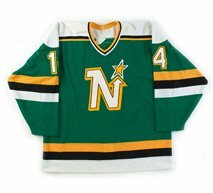 Moore then sold the club back to it's original owner Mileti, but for the 1976-77 season, it was announced that the NHL's California Golden Seals were moving to Cleveland to become the Barons, and would be setting up shop at the Coliseum. 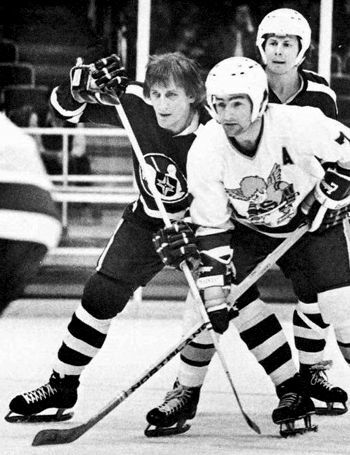 Knowing the city could not support two professional clubs, Mileti's proposed sale, which would have moved the team to Florida, fell through and the franchise eventually was relocated to St. Paul, where it became the second incarnation of the Minnesota Fighting Saints. 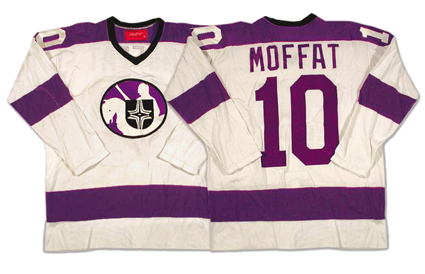 Today's featured jersey is a 1975-76 Cleveland Crusaders Kyle Moffat jersey. 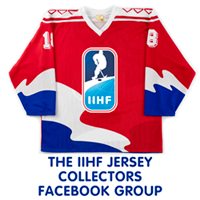 The Crusaders jerseys can be divided into two periods, with their first two seasons sporting three stripes in the "Northwestern" pattern and the last two seasons with a single bold stripe on the arms and waist as seen on today's featured jersey. Today's video section begins with footage of the Crusaders in action, where the narrator insults your intelligence by explaining what a "faceoff" is. Note the three stripe pattern on the Crusaders jerseys. Pay no attention to the fact that there's chicken wire fencing at the end of the rink!